Start with the basics! Chris Liepe has decided to step away from his epic song covers to introduce his Beginner Electric Guitar Series. Chris breaks concepts down into their most basic elements. From terminology to understanding basic guitar, Chris covers it all in this lesson. Here you will learn about the parts of the guitar as well as terms and vocabulary that will make it easier for you to pick up the guitar and play. We'll also work on correct posture, hand positions, and tuning your guitar. Headstock - Includes the tuning pegs that raise or lower the sound of the note by tightening or loosening the strings. Your guitar may have all six tuners on one side of the headstock or three on each side. Nut - Holds your strings in position and functions as the start of the playable section of the neck. Neck - Made up of the headstock and the fretboard. Fretboard - The piece of wood that your fingers play on. The fingers are positioned between the metal dividers on the fretboard. Frets - Each space between the metal dividers on the fretboard is referred to as a "fret." The first fret is closest to the nut. Strings - There are six strings on most guitars. The thinnest or highest sounding string is referred to as the 1st string. The 6th string is the thickest and lowest sounding. Body - Pretty self explanatory! Bridge - Where the strings connect to the body. Pickups - Use magnetic energy to translate string vibrations into amplified sound. Pickup Selector - Chooses which pickup is active. On most electric guitars, two pickups typically can be blended for different sounds. Volume and Tone Knobs - Further adjust your sound on the guitar by adjusting these knobs. Adjustment of these knobs produces a different and unique sound compared to adjusting them on an amplifier. Pick Guard - Not every guitar has one. The pickguard keeps you from scratching up the body when strumming aggressively. There are two ways we'll be referring to the names of the strings when teaching chords, scales, etc. 1. They will be referred to as numbers. The 1st string is highest and thinnest. The 6th string is lowest and thickest. 2. We will be talking about the strings in terms of their actual note names. The 1st fret is next to the nut. The frets are numbered higher as you get closer to the body. Most guitars have dots on the 3rd, 5th, 7th, and 12th frets, making it easier to find your place on the fretboard. As an exercise, try placing your 1st finger on the 6th string, 5th fret. Here are a few valuable tips on properly holding the pick. - Make a gun shape with your right hand. - Bend your index finger in so that it touches the palm of your hand. - Place the pick so the large end is on the side of the nail portion of your index finger. - Bring your index finger and thumb together and relax your other fingers. - When you strum or pick individual notes, make sure that the primary motion comes from the wrist and not the arm. There are two ways to tune - by ear and with a tuner. First, we will talk a bit about tuning by ear using the "5th Fret Method." - Tune your low E string to a piano, tuning fork or another guitar that is in tune. - Play the 5th fret on your low E string. This produces the pitch A, the same pitch of the "open" 5th string. Play both 5th fret E string and open A string. Adjust the A string until its pitch matches the note played on the 6th string. - Then, play the 5th fret on your A string and then play your D string open. Adjust the D string. - Play your 5th fret D string followed by your open G string. - Now, when you get to adjusting your B string using the G string as a pitch reference, you must play the G string on the 4th fret because of the way the guitar is set up. - Then, play 5th fret on your B string while adjusting your high E string. - Assuming that you have tuned accurately and your guitar is set up correctly, your guitar will be in tune! Being able to tune by ear is nice, but it's not always practical. If you need to tune in a noisy environment, or where other musicians are around making noise, using an accurate and easy electric tuner may be easier. Here are a few tips on using an electronic tuner. Any tuner on the market will generally work well, but as a general guideline, try to at least buy something in the $15-$30 range. Every guitarist realistically should own an electric tuner. Here are a few tips on proper playing posture. Heed this advice well as it will greatly increase your comfort while playing. - For starters, make sure you are sitting on an armless chair or a stool. - Whatever you are sitting in, make sure that your knees are able to be bent at a 90 degree angle or slightly less so you can support the guitar on your leg. - Sit in a relaxed position that is not too far forward or there will be too much pressure on your back, leaving you sore very quickly! Whenever your are "fretting" any notes, whether scales or chords, make sure the joint of your thumb is on the "hump" of the neck and that your thumb is positioned between your 1st and 2nd fingers. Every electric guitar player needs an amp! Here are a few tips on setting up and using your amplifier. - Grab your guitar instrument cable. - Most amps are called "dual channel" amps which means they have a clean sound and a dirty sound each on a different channel. You can switch between the two. - Clean sections of the amp typically have volume, bass, mid and treble settings. - Dirty sections have what is called a "pre gain" and a "post gain" setup. - The "pre gain" controls how distorted or overdriven you want to make the sound. - The "post gain" controls how loud you want that distorted sound to be. - Some amps will have a reverb control to add some space to your guitar sound. Stay tuned for lesson 2 where you'll learn your first chords! Alright welcome to my beginner lesson series. This is the first lesson. We have done a few lessons already. Carol of the Bells, Where did you sleep last night and Heartbreak Hotel. Hopefully you guys have enjoyed some of those. to hopefully playing some cool songs and really getting into it. My lessons are going to be primarily focused around the electric guitar. but using gear in a way that helps you capture sounds that you hear on the radio and on the internet and everyday. Alright. For this first lesson we are not going to do a lot of playing. We are going to do more looking at the guitar. Learning about different terms different vocabulary. So that when I say to do something you understand what's going on. We are going to look at the names of the strings. We are going to look at the different parts of the guitar. We are going to look at how to hold the pick. We are going to look at basic good posture and hand position for practicing so you don't get uncomfortable and sore. We are also going to work on tuning and different methods for that. Ok! So let's go over the parts of the guitar. We are going to work from this direction here. First we've got the headstock. You will see headstocks in two different flavors really. This is a Gibson Les Paul headstock it has three tuners on one side and three tuners on the other side. Some Fender guitars, Ibanez guitars most of them are going to have six tuning pegs up here. So the headstock houses the tuning pegs and is where you connect the strings on this side. Next we've got the nut. The nut is what holds the strings in place and makes them spaced evenly as you are playing and bending and for any chords. and it is really important when you start playing to make sure that this is set up correctly. so you can play well from the very beginning. After the nut you've got the fret board. The fret board of course and all of this stuff is included on the neck. The fret board is where you actually make the sound where you actually make the notes. The little metal dividers actually in between each metal divider is a fret. That is a very large misconception when you start playing the guitar. When your teacher might say something like play on the first fret and you actually put your finger on the metal thing. you're going to be between the nut and the first metal divider. Or if you are going to be playing a note on the second fret it's going to be between the first metal thing and the second metal thing. Strings. There are a couple different ways to refer to the strings which we are going to talk about in a little bit. For now this high string here we are going to refer to as the first string. The lowest string in sound is going to be referred to as the sixth string. That leaves us with one two three four five six. Most of you probably know that this is called the body so that is pretty self explanatory. It is really what is on the body that counts. Really the backbone of where the guitar is all connected is back here in the bridge. That is where your strings connect to back here. This guitar is kind of cool because the strings don't need to go through the body. The strings just connect back here to the bridge. We will have a lesson in the future about changing strings on different types of guitars so we will get to that later. For right now the bridge is what holds the string in place back here. Next we have got the pickups. The pickups are going to be using magnetic energy to translate vibrations into notes. There is a lot of different pickup configurations depending on what guitar you play. and this pickup selector is basically going to determine which one of these are on or it is going to be able to blend the two. So if I've got this pickup selector put all the way down to the treble section it's going to be only using this pickup. If I've got the pickup selector all the way up to the rhythm it's going to be only using this pickup. This is called the neck pickup and this is called the bridge pickup. If I have this pickup selector directly in the middle it's going to be using both.this pickup. 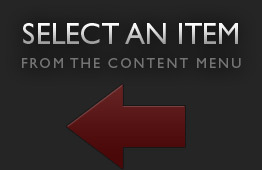 If I have this pickup selector directly in the middle it's going to be using both. Each one gives you a slightly different sound. I am going to go ahead and just play a chord and give you a little bit of a demonstration. Notice this sound is much brighter than this sound and different still than the middle blended sound. The last section that we are going to be covering here are the volume and tone nobs. These front nobs here are the volume nobs. Each pickup has there own volume nob and again things are going to be different on your guitar. Most guitars have at least one volume nob and at least one tone nob. This will still be applicable even if you are not playing a Gibson Les Paul. I can adjust the volume on just this pickup. and I can adjust the volume here on my neck pickup. Also each one of these pickups have there own tone nob. Basically what the tone nob is going to do is roll off the high end sound of your strings. The last section here on the body is the volume and tone nobs. The volume nobs are going to adjust on this guitar specifically each one of these individual pickup volumes. The tone nobs are going to shape the sound a little bit. They will bring your high sounds up a little bit and your low sounds down. when you are plugged into an amp and figure out how those sound on your particular setup. So let's focus on the strings now. and the highest sounding string is going to be your first string. Your lowest string is going to be referred to as your sixth string. The other common way that they are referred to is by there actual note names. Be sure to look in the supplemental material directly below you to get a visual representation of this in a different way. Your first string your highest string is also called an e string. That's going to be represented when you see it in writing as a lower case e.
The rest of them are going to be written as capital letters. So you have got an e string as your first string. The second string is also referred to as the B string. The third string is referred to as the G string. fourth string is also the D string. The fifth string is called the A string. The sixth string is a capital E.
So you have got capital E lower case e.
E. B. G. D. A. e.
they are going to be referring to it referring to the strings in both of those ways. It's good to have those things interchangeable in your mind as we are learning chords scales songs etcetera. Now let's look at the frets. and not on the metal dividers. The first fret here is going to be right after the nut. Then they are numbered consecutively all the way up the guitar. on the third the fifth the seventh the ninth and the twelfth frets. So you can kind of see where you are playing. It is a nice reference when you are watching someone play the guitar and you are trying to figure it out yourself. This guitar here has a duplicate pattern here after the twelfth fret. and the notes that you are playing up here when you are playing on the twelfth fret are the exact same notes. So the guitar starts over after you hit the double dot which you can see here or after you hit the twelfth fret. The last bit of terms and vocabulary that you want to be aware of is finger numbers. we are going be referring to the index finger as the first finger. The middle finger as the second finger. The ring finger third finger and the pinky as the fourth finger. So one two three four just like most people count. you would play that note. or your fifth string on the third fret you would play here. Hopefully you have a good handle on some of the terms vocabulary and parts of the guitar. Next we are going to look at holding the pick. An often overlooked aspect when you are starting the guitar is how to hold your pick. A lot of times we just kind of pick it up and start using it. because it is really going to affect everything, everything you play. Whether you are picking single notes whether you are strumming etcetera. Here is how one of my first guitar teachers taught me how to hold the pick. A little bit cheesy but it works. First you make a gun with your right hand. and you place the pick with the large part directly over this joint on your first finger. Then you bring your thumb and your first finger together you are holding the pick correctly. Now you want to make sure you are relaxing the rest of your fingers and that you keep this kind of form the whole time. When you bring this to the body of the guitar and you start strumming it should be directly in line with your playing. Some common ways that people hold the pick incorrectly are they try to hold it like this. That works decently well for strumming chords but it is really lousy when you start trying to play individual notes. There is too much play here. So again make sure you are holding it like this. You are leaving just a little bit staying out here to pick your notes and that you are relaxing these other fingers. All of the movement that you produce with your pick should be coming from your wrist. As opposed to using your arm or your shoulder. your shoulder is going to be sore and you are not going to have fun playing. So make sure you are just using your wrist. Let's go ahead and look at in the next session a few basic ways to tune your guitar. There are two common ways to tune your guitar. This is really after you get familiar with your guitar in terms of what everything is called. This is really where you want to start. Make sure your guitar is in tune because everything you learn after that is going to sound so much better. and the electronic tuners the decent ones range between about fifteen and thirty five dollars. Make sure that it's got a built in mic and that it has also got a way to plug your guitar in. That way if you are playing your acoustic guitar you can use it there also. Any local music store will have them and you can order plenty online. That is the first way to tune. It is always a good idea to know how to tune by ear which is the second common way to do it. Tuning by ear using the fifth fret tuning method is what it is called. Most of the notes we are going to be playing here to get our guitar in tune will be based off of the fifth fret. to a piano, a tuning fork or another in tune guitar. The important thing is what you are tuning to is in tune. If you have got your electric tuner you can practice if you have a piano in the house, a keyboard, a tuning fork etcetera. You can practice getting it in tune with your ear and then checking it with your tuner. So start by getting your low E in tune to a piano or something and then here is what you do. just because it is nice and comfortable. So you are going to play your E string on the fifth fret and when you play your E string on the fifth fret you are getting an A. The A is the same note as your fifth string. If you are tuning and if your guitar is set up correctly these should be exactly the same note. If they are not you adjust your tuners. Now here we have got on this guitar we have got my E string, A string and D string tuners up here. We have got my E. B and G tuners down here. So fifth fret second finger E string gives you an A. Since we know my E is in tune I will be adjusting my A string until they are the exact same note. Which thankfully I have tuned for the both of us. Thankfully I've tuned at the beginning of this lesson. Next you are going to put your second finger on the fifth fret on your A string and you are going to get a D.
Which is the same name the note name as your D string so those should be in tune. You are going to go to the next set of strings once you have adjusted that. Play your D string on the fifth fret and that should be a G.
instead of the fifth fret. You are going to be on the fifth fret the whole time here but when you get to the G you are going to play on the fourth fret. That's a little bit off so here bringing it up just a little bit, it is a little bit closer. Now that I've got those in tune I am going to come down here and we are going to go back to the fifth fret on my B string. Which gives me an E and that also is off. There that's a little bit better. So again fifth fret second finger bring these all the way down the strings comparing each note. Fourth fret when you get to the G string to adjust your B string and then back to the fifth fret for your E.
What I like to do when I get done is make sure that my high E and my low E are decently in tune with each other. go back and forth while learning this method to help train your ear. Start by playing with a piano or with a guitar etcetera and tuning that way and then double check yourself with your electronic tuner. because you can't always grab that tuner when you need to be in tune. Next we are going to look at proper posture and left hand techniques. and you are able to be the most efficient you can be with your left hand. so you have plenty of room to move around and get comfortable. so that your knee is at a ninety degree angle or slightly less. That gives you a nice comfortable way to rest your guitar on your leg. We will go over strap height later. For now we will practice sitting down unless you've got a back problem. Sitting is just a good comfortable way to start. and put too much strain on your back. will be a little bit sore. So make sure you're not hunched over guitar too much make sure you are sitting upright. Check your posture every now and again and make sure you are not slouching to much. Now a really common mistake people make when they start playing is positioning their left arm strangely. You want to make sure that when you've got your hand out here that your elbow isn't too far in or too far out. not being coordinated enough to play the chord. Make sure your wrist is nice and straight and that you are leaving plenty of room between your arm and your body. is placed on the hump of the neck or the highest part of the neck directly in the middle. So if I show you the back of the neck here is where my thumb should be. Here is the joint of my thumb and it's right in the middle of the neck where the curvature is at, at it's peak. That's going to give me plenty of support when I am playing notes and it's going to give me plenty of grip when I'm playing chords. Having my thumb here also gives me plenty of room for my hand to move around out here. and makes it harder to play. and you have got plenty of hand out here to deal with things. Ok. So we have talked a lot about the guitar. Most electric guitars are played through an amp. Let's talk a little bit about the amp. Grab your instrument cable plug in your guitar turn your amp on and make some noise. Most basic amps and you want to start with a basic amp they are going to have the following sections. They are going to have a volume nob. They are going to have a general EQ with highs lows and mids that you can turn to kind of get your tone exactly the way you want it. Then they are going to have a pre and a post section and this is where some people get confused. Your pre and your post section is going to be part of the second channel on a two channel amp. Which most amps are. You are going to have a clean channel and you are going to have a dirty channel. is going to give you the distorted sound that you hear on most rock music. versus how much clean sound you have on that channel. Your post acts as the overall volume for that channel. Your pre acts as the amount of gain or the amount of dirtiness that you are going to have. Those usually operate independently of the clean volume. So if you've got a foot pedal or just a little switch on your amp you can set two different sounds and switch back and forth. Some amps have a shared EQ. Share high low and mid nobs and some amps have different high low and mid nobs for each one of those channels. I recommend when we start practicing chords that you have a pretty clean sound to start out with. Of course experiment as much as you possibly can with different sounds and find out what works for you. There is a summary on your amp and a good first look at your guitar. Join me for my next lesson in the beginner lesson series where we are going to start learning our first chords. Great first lesson! Knew most of this,but watched anyway. Just so we are on the same page! Thank you for a really great summary, especially of the Les Paul features. I have been playing acoustic, so all the knobs and adjustments on them are still unfamiliar to me. Same goes for adjustments on my amp. Looking forward to learning more! Chris, thanks for getting me started. Looking forward to your lessons. Why am I getting this message" Error loading file?" Nicely put to gather in a compact format. On the 12th fret of E, it is a little confusing to call it the same note as 0, when the fret board is starting over. Would calling it one octave higher be a little less confusing? Good Intro, some little hick ups but all in all straight forward. Having so much fun. Good introduction to parts of the guitar without the confusion. THNX. You have to update the progress yourself on the left of the video in the Progress tab. Great lesson! A lot of good tips on posture and i learned more about the volume and tone adjustments. thanks for your time! I like your teaching style. I think this will work for me. At least I hope it will with effort from me. Wow, can't believe how wrong I've been over the years about pick holding and elbow position. First lesson and I know already that I won't be asking for a refund. Thanks Chris! 8 years of holding my pick wrong and wondering why I didn't have enough control to get better and consistent articulation and speed. THANK YOU! I knew most of this but wanted to go through some of the details in case... I missed something and sure enough I have... Thanks! i went through this 3 times till i got it. LOL. When using a Chromatic Tuner how close do you have to get ? Is +/- 1-2 cents good enough ? Beginner here. Thanks for the great first lesson. I was confused by another instructure as his lesson was tuned down a half step or something and I couldn't figure out how to tune. Thanks Good Work. Wow your a great teacher, being a not so beginner I thought your thoughts were informative..keep it up.. I also appreciate the fact that you lay out your whole class in the description. I have to admit i skiped some parts which i think i have no queries on..i read your description.. all I have to say is great content..
maybe you found this, but you set your progress manually with the progress bar - useful for when you move between instructors. Im having trouble getting my left hand t reach all the frets. What can i do? examine your hand position. Make sure your thumb is behind the neck so that the joint closest to your fingernail is on the 'hump' of the back of the neck. make sure you're using mostly the tips of your fingers. Don't rest your arm on anything while playing. Practice while standing up with a strap that is fitted so that your guitar covers your stomach. The G string seems to be the one that is hardest to keep in tune for me, is this normal with most guitars or is it something I need to fix with a set up? Liked the first lesson a lot, easy to follow and get the basics. Thank you! glad things are clicking for you! Keep in touch! I liked this. It was easy to follow and laid everything out in simple terms. I am looking forward to the rest of this series and some of Chris' live webcam shows. Am looking forward to the next lesson! So glad to have another perspective on the beginner series, focusing on the electric guitar. Nice job on the intro to the electric guitar. Will be waiting for the next lesson. Chris Liepe talks about the absolute basics of the guitar, including tuning, the guitar parts, and proper technique. Chris Liepe is back in lesson 5 with an introduction to scales. In this lesson, you will learn how to play up and down simple scale patterns. Chris Liepe lays down some grooves in this lesson! He provides instruction on rhythmic strumming patterns and time signatures such as 4/4, 3/4, and 6/8. Intervals, Intervals, Intervals! Chris Liepe explains what they are, where they are found, and how to play them in this lesson. Chris Liepe breaks through his 10th lesson with a detailed discussion of triads. Dig in and take these triads for a ride! This lesson begins a mini-series on effects pedals. Chris breaks down routing and how effects work with each other. Chris Liepe is back with the 3rd installment in his Effects Pedal mini-series. He explains the concept of "gain stacking" by combining an Ibanez Tube Screamer and a Boss DS-1 Distortion pedal. Chris Liepe quickly demonstrates the chorus pedal with some 80's style licks. This pedal can create a deep and rich addition to solos or add the illusion of multiple guitars. Chris explains and demonstrates the very basics of alternate picking. He also provides simple exercises to develop the technique in your own playing. 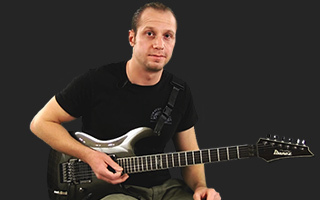 Chris details and demonstrates the fundamental movements and suggested left hand position for legato playing -- specifically hammer-ons and pull-offs. He also provides exercises for developing the technique. Chris talks about proper palm muting and discusses potential snags when first attempting the technique. He offers a number of exercises and patterns to help palm muting become a part of your rhythm playing. Chris talks about what it means to play in position and teaches three of the five "CAGED" major scale positions in the key of G.
Chris continues in his teaching of the five basic "CAGED" major scale positions in the key of G.